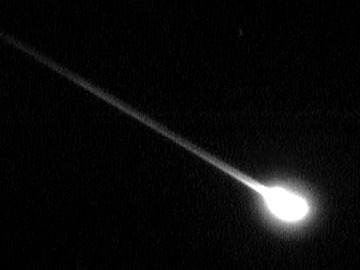 Meteor image by George Varros taken during the 2002 Leonid multi-instrument aircraft campaign. The rain scared everyone away at about 4:30 a.m. (12:30 UT). On the way down the road, we began seeing a really nice clearing, and many meteors. At 12:55 UT a double flash split by one degree changed color from yellow to orange. 15 degrees from Corvus - 12:59 UTC - yellow to orange to red ... a whopper. A huge audible "WOW!" emanated from my cassette recorder. 10 degrees above Corvus a horizontal meteor a split-second later. Then another. And another. We saw a couple dozen Leonids within a span of about 15 minutes, capped with the brilliant zodiacal light, a cone of light pointing toward the milky way above. The ARIA flew through the old comet debris. The peak of the Leonid storm of 1999 was over so soon! The anticipation, the speculation, the practice had drained every ounce of our energy. We had eaten every peanut butter cracker, every Skittle in sight. The storm peaked at 2300 ZHR barely 20 minutes after it began. By 03:00 the numbers were down to 500 ZHR, still a lot of beautiful meteors to observe and count. By 04:00 the count was back down to less than 50 Leonids per hour, adjusted to ZHR. Although exhausted, we tried our best to keep observing, to catch the falling stars, to record our meteor counts. And to bid farewell to the Leonids for another year. In a nutshell, we saw maybe 40 Leonids all night long from 11:00 until 03:00 am. (UTC 7:00 until 11:00 UTC November 17) I hope we caught some of the brilliant fireballs on film. A dozen great fireballs, and three dozen lesser Leonids. Many with brilliant persistent trains. It was so cold I had frost on my shortwave radio. "Running along the horizon basically about uh 10 degrees elevation from perhaps southeast to east ... no ... no ... that would be east to southeast ... cool 07:54 ... it died about 15 degrees south of the east end of Lepus." Crinkle of space blankets ... they do work! Nice long train ... a slow Taurid ... running along the bottom of the dipper, no in the middle of the big dipper. 40 degree train, maybe magnitude -2 although it got brighter then dimmer as it went by. It was going toward Cassiopeia but it didn't quite make it. Aussie Bob Ostergaard wrote: At 0130 my eyes snapped open as I heard cheers way beyond what you get at fireworks displays as a massive fireball came up over the eastern horizon, zipped right overhead, and continued on over to the western horizon, leaving a bright train that glowed for minutes high in the atmosphere. The best meteor I'd ever seen in my life, up to that moment. If you've seen the Bruce Willis movie "Armageddon," you have an idea of what it looked like, except none of these meteors hit the ground. Quite frankly it was more and better meteors than I've ever seen in my life, and better than most fireworks displays I've ever seen. I ended up logging 1,596 Leonids, and maybe 10-15 sporadic meteors. Towards the end of the night the radiant of the Leonids was more than apparent, it was a fact of life, like a giant astronomy experiment you've only read about and now see come true. By dawn on Leonid morning our team had counted 18,600 meteors. I personally counted 3,730 Leonids and 98 sporadics, many of which were slow bright Taurids. My highest one minute counts came at 04:09 UT during the first shower when I counted 60 Leonids and one sporadic. My highest one minute count for the second peak came at 10:50 UT when I counted 75 Leonids and 1 sporadic meteor. This is no surprise - these are the exact moments of the peaks for both storms. For the 15 minutes before and 15 minutes after the first peak I counted a total of 920 Leonids and 19 sporadic meteors. For the 15 minutes before and 15 minutes after the second peak I counted a total of 1063 Leonids and 9 sporadic meteors. That is more than half of all the meteors I counted in over 6 hours of counting! The Leonid rate stayed quite high - we counted about 100 Leonids per hour during all the hours between the two peaks. We had an extra bonus on our flight over the polar regions - the aurora borealis, or northern lights! Dr. Peter Jeniskens wrote "A curtain of aurora over the northern horizon emitted pulsing waves of light into the sky, penetrated by a rain of meteors." The intensified view through my i-goggles was breathtaking and lasted for well over an hour, with columns, sheets, swirls and rays of shimmering light filling my field of view, punctuated by dozens of meteors per minute. I rushed to the window to see the aurora and meteor storm for myself without the aid of goggles or cameras. The pale white glimmering sheet with subtle hints of red and green was stunning. What a grand finale to the multi-instrument aircraft campaign!